How often do you need to see a species, before you view it as being ‘characteristic’ of a particular ecosystem? Some species are widespread and abundant. Others occur sparsely, but are found only in one ecosystem. Some of these sparse species become common after rare weather events or disturbances. All of these species might be viewed as being ‘characteristic’ of a particular ecosystem, even though they have different distribution patterns. But if you hardly ever saw a species in a particular ecosystem, and you usually found it in a different ecosystem, you’d be hard pressed to call it ‘characteristic’ of the ecosystem you never saw it in. Seems obvious, yes? So, one more question – what if the species was always common in the soil seed bank, but never found in the vegetation? Would you say this species was ‘characteristic’ of the ecosystem? After all, it’s always there. I pondered this question after reading a recent paper on grassland seed banks. The study found that many of the most common species in the seed bank were never found in the vegetation. Consequently, the authors described the seed bank species as being ‘not characteristic’ of grasslands. I’ve probably expressed similar sentiments in my papers too. Which is curious. If we count up all the plants and all the seeds, then the most abundant species in many ecosystems are those in the seed bank that we rarely see. So we probably should view these species as being ‘characteristic’ of the ecosystem. After all, soil mycorrhizae are characteristic of grasslands (and other habitats), even though we don’t see them. Similarly, the bacteria E. coli is ubiquitous in the gut biota of humans. No matter how much I try, I just can’t deny that the bacteria E. coli is characteristic of all my best friends. In ecosystems across the world, soil seed banks contain species that are rarely seen in the vegetation. Seeds of many of these ‘invisible’ species are extremely abundant. In a recent blog, I talked about grassland plants that don’t persist in the seed bank, and the high risk of local extinction that these species face. But Australian grasslands and woodlands also contain species with persistent seed banks, many of which are rare in the vegetation. One group of plants that is really common in grassland and woodland seed banks includes the rushes and sedges, such as Juncus, Isolepis, Cyperus, Schoenus and other genera. These include annual species (e.g. Juncus bufonius, J. capitatus and many Isolepis species) and many large, long-lived, perennial rushes and sedges. In a recent study from northern Victoria, two thirds of all of the seeds that were found belonged to just four species of Juncus or Isolepis. In another study, two thirds of all of the seeds in black box woodlands were from a single native sedge, Cyperus difformis. This sedge wasn’t found in the vegetation, despite its abundance in the seed bank. One soil sample contained 206,000 Cyperus seeds per square meter of soil, which is a lot of seeds. Most plant species have very ‘patchy’ soil seed banks. Seeds may be abundant in one area (under an old plant for example) but completely absent just a few centimeters away. By contrast, seeds of some of these rushes and sedges are so abundant that they tend to be found almost everywhere. I once studied seed banks in remnant grasslands and woodlands in Gippsland, Victoria. There were seeds of the Broadleaf Rush, Juncus planifolius, in virtually every soil sample in the remnant forests, even though I never saw the species in a forest (it did occur in some roadside ditches and wetlands). I still find this amazing, as I’d walked and worked in these forests for many years. Many of the species that form persistent seed banks in grasslands are really common on damp mudflats and in wetlands. Indeed many of the ‘non characteristic’ species in grassland seed banks are ‘characteristic’ wetland species. Wetland plants are renowned for forming large, persistent seed banks. This is a great strategy for surviving in temporary pools that intermittently flood and dry out. Plants flower and set seed during wet seasons, and then die back to persist in the soil seed bank during dry periods. But how do so many of these wetland seeds get into dry grasslands? Many ‘mudflat species’ grow in small damp depressions in grasslands and woodlands, and seeds from these plants may gradually accumulate in the seed bank. Seeds of other species might disperse into dry grasslands. Water birds are renowned for spreading seeds from wetland to wetland on their muddy feet. However, it would take a lot of ducks, with really dirty boots, to disperse millions of Juncus or Cyperus seeds across the countryside! Perhaps the Juncus planifolius seeds were deposited in the Gippsland woodlands long, long ago. 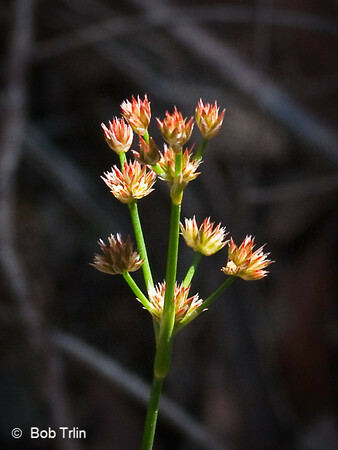 Big floods may have triggered Juncus to grow and set seed in forests that are normally far too dry. Large areas of eastern Australia flooded this year and last year (see John Morgan’s blog). Do these rare events refill the seed bank with sedges and rushes? If the world was heading for ‘global wetting’ rather than global warming, I wonder… would we view our grasslands as being inherently ‘resilient’ to global change, since they contain abundant seeds of native plants ready to thrive when sites get wetter? Persistent seed banks impart resilience to ecosystems, not stability. Regardless of whether we like the invisible ‘uncharacteristic’ species that they contain, seed banks enable ecosystems to respond rapidly to variable environmental circumstances. A characteristic feature of all of our grasslands and woodlands is the presence of an abundant, invisible seed flora, full of ‘uncharacteristic’ grassland species, quietly waiting for their moment in the sun. I am grateful to photographer Bob Trlin for permission to copy the photo of Juncus planifolius from his wonderful collection of photographs of the Bush Flora of Ku-ring-gai. Bob’s web site is well worth visiting. The seed photo in the header image is from wikipedia. Brock MA (2011) Persistence of seed banks in Australian temporary wetlands. Freshwater Biology 56, 1312-1327. Eldridge DJ, Lunt ID (2010) Resilience of soil seed banks to site degradation in intermittently flooded riverine woodlands. Journal of Vegetation Science 21, 157-166. Leck MA, Schutz W (2005) Regeneration of Cyperaceae, with particular reference to seed ecology and seed banks. Perspectives in Plant Ecology Evolution and Systematics 7, 95-133. Lunt ID (1997) Germinable soil seed banks of anthropogenic native grasslands and grassy forest remnants in temperate south-eastern Australia. Plant Ecology 130, 21-34. Scott AJ, Morgan JW (2012) Resilience, persistence and relationship to standing vegetation in soil seed banks of semi-arid Australian old fields. Applied Vegetation Science 15, 48-61. Ian – seedbanks really intrigue me too. Most grassland seedbanks in my area consist mainly of “weedy” species – annual opportunistic species that are adapted for conditions with little competition from other plants. One interpretation of the lack of more conservative plants and the dominance by opportunistic and relatively common species is that this is why conservative plants are rare, and that we need to be cautious about how we treat ecosystems so we don’t hurt those conservative plants since they can’t come back quickly from the seedbank. Another interpretation is that the primary role of a seedbank is to provide a quick-responding plant community in times of great stress (drought, flood, soil turnover by a badger, etc.) and that long-lived perennial conservative plants are not cut out for that role. While I don’t disagree completely with the first interpretation, I tend to think of things more in the latter sense, and thus don’t worry about the lack of conservative plants sitting around in the soil. On the other hand, it does make you wonder how those long-lived plants reproduce and sustain themselves if they don’t utilize the seedbank. Most use rhizomes, of course, but that’s only a partial strategy. There’s got to be a sexual reproductive (seed) component in there. Maybe they do reproduce by seed, but because they produce relatively few seeds compared to “weedy” plants, we don’t pick them up readily in seedbank studies? Or maybe their seeds are eaten more quickly by granivores? A final thought: There are (at least) two ways to look at seedbanks. One is to see what seeds are there. The second is to see what actually happens when you create conditions that allow the seedbank to activate and provide new plants – badger digging, etc. Many research projects focus largely on the first, but not much on the second. The second seems the most relevant to me. Hi Chris, thanks once again for your informative and detailed reply. I assume from this that conservative species, by definition, don’t have big seed banks, or, put another way, that any plant species that did have a large seed bank, and which regenerated abundantly from it, wouldn’t be classed as a ‘conservative species’. Is this right? One of the challenges for any species that produces big seeds is that seeds are one of the most nutritious food sources available, so big seeds tend to get eaten very quickly, unless they have a very hard, predator-proof seed coat. On the other hand, all of those resources mean that seedlings from big seeds have a bigger energy source, so can push up through shading soil and vegetation more successfully than seedlings from small seeds can. So there’s less benefit in ‘hanging around’ in the seed bank for big seeds. Seed bank studies are really hard to do well, as the main limitation when designing them is, how much glasshouse bench space do we have? Consequently they are good at detecting species that have abundant seeds, but not so good at detecting species that have very sparse seeds. Your last point is a really good one. In a way, seed bank studies show us those species that have not germinated and established in the wild, whereas we are really concerned about those that do germinate readily. I don’t think I’ve done justice to all of your points above unfortunately. Great response – thanks. From a restoration standpoint, I think the big message is that we need to be realistic about the role of seed banks. They’re not built to re-establish an entire plant community if the aboveground plants get wiped out. In perennial grasslands, at least, seed banks (I think) are really meant as more of a immune response to small wounds. They provide plants that can quickly scab over an open area until the surrounding perennial vegetation can fill back in from the edges. Don’t you think? You wrote, Ian, “Seed bank studies are really hard to do well, as the main limitation when designing them is, how much glasshouse bench space do we have? Consequently they are good at detecting species that have abundant seeds, but not so good at detecting species that have very sparse seeds.” Another limitation that may be really important is the inability to provide specialized environmental stimuli for certain species. Those that respond to, just as an example, smoke chemicals, may not germinate in a standard glasshouse bench setting. It seems to me likely that seed species (possibly even fairly abundant ones) are still hiding ungerminated in the soil sample, awaiting the correct stimuli, even after the seed bank study is “done”. Hi James, thanks for your great comments. Both are spot on, and I couldn’t agree more. Interestingly, smoke hasn’t been found to have a huge effect on germination of grassland seedbanks in SE Australia. It alters the relative abundance of seeds of different species, but doesn’t seem to promote many species that wouldn’t otherwise be recorded at all. By contrast, it has a huge impact on many species in Australian heathlands, and without it many heathland species (i.e. those with ‘recalcitrant seeds’) won’t germinate at all. The degree of inundation is another factor that greatly affects germination. Seeds of many wetland plants are very sensitive to the flooding, and some species will germinate abundantly when soil samples are flooded, whereas others germinate more abundantly in moist, but unflooded, samples. Your last sentence is very true, and seed bank studies usually qualify their finding by stating that the results describe the number of ‘germinable seeds’ under the study conditions, and not the total seed pool. However there are a group of species whose seeds germinate rapidly, even when the seeds are buried deeply, and which don’t have any physiological ability to form persistent seed banks. In grasslands around the world, many of the common, dominant, perennial species have seeds that behave this way (see my last blog on ‘super seeds’ for some examples). These species don’t get detected in soil seed bank germination studies unless the soil is sampled just after the seeds have dropped, and before the seeds have geminated or decayed. I always look forward to new posts on this site. Thanks, Ian. I bought on run down old horse paddock in North Central Victoria a few years back and have been planting a mix of indigenous and non-indig natives ever since. I had a large shallow water put in a couple of years back and was surprised to see a diverse range of Juncus species begin to grow almost immediately. At the time I assumed they must have grown from seeds attached to the earth moving equipment that built the pond but maybe some grew from the soil seedbank as well. Also, partly inspired by this site, I’m now having fun planting some less common grasses like Aristida behriana and Austrostipa breviglumis as well as other indigenous grassland species like Blue Devil (Eryngium ovinum) and Yellow Rush Lily (Tricoryne elatior) in areas I’ve fenced off from herbivorous beasties. Hopefully, in time, there will be some spillover of seedlings into the unprotected areas. Cheerio and thanks once again.